If you’ve ever doubted what today’s youth can accomplish, you need look no further than what 50-60 elementary and middle school students can accomplish in one week when Missoula Children’s Theatre makes their annual April pilgrimage to the PAC. MCT hits the road every year with over three dozen “little red trucks” and visits over 1,000 communities from Montana to Japan in addition to our own. 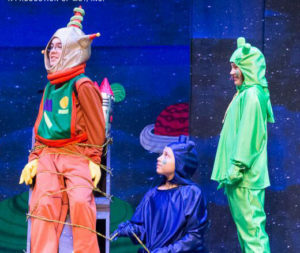 And in every town, in less than four days of rehearsal, students perform their very own musical with full sets and costumes for families and friends. Educators will pontificate that these students attain creativity, social skills, goal achievement, communication skills and self-esteem through their participation in this unique, educational project. But I can tell you from personal experience over the years that the students that spend the week here at the PAC with MCT are changed forever and will grow up to change the world. Auditions for 1st – 8th grade students are April 8th at 4PM sharp and public performances are Friday, April 12th at 7PM and Saturday, April 13th at 2PM. Learn more about auditions and performances at our MCT dedicated web-page (https://thepac.net/robin-hood) and learn more about MCT’s organization at their website (mctinc.org). 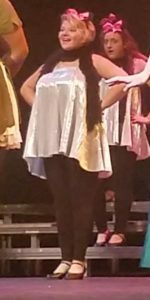 April’s PAC Kid Spotlight, Amaya Muse-Holt, down front and center! This month the PAC Kid Spotlight shines on North Middle School student Amaya Muse-Holt. She just finished performing in Allegro Dance Theatre’s presentation of Mary Poppins, Jr. last month and this month will be performing with her middle school band at the KMEA festival as well as auditioning for Youth Theatre’s summer production of Hello Dolly. Learn more about Amaya and our other PAC Kids. Congratulations to DIANE RONKAINEN — lucky winner of a $20 PAC gift certificate for completing their Kentucky Shakespeare’s Macbeth program survey. THE PAC PRESENTS: AUDITIONS for Missoula Children’s Theatre’s ROBIN HOOD (2 hours) Mon, April 8, 2019 at 4 PM SHARP. All 1st through 8th grade students are invited to audition. It is a group audition — no advance preparation is necessary. Just be prompt, and come ready to have a good time! Auditions are free. If you are cast, there is a $20 participation fee. Rehearsals take place Tues – Thursday April 9-11 4-8:30 PM, schedule varies per cast of characters. Audition form coming soon. THE PAC PRESENTS: PERFORMANCES of Missoula Children’s Theatre’s ROBIN HOOD (60 min). A merry time will be had by one and all! Embark on a swashbuckling adventure with the legendary Robin Hood, Maid Marion, the Sheriff of Nottingham and a host of others brought to life by a cast of local students and Missoula Children’s Theatre. Fri, April 12, Noon & 7 PM. Sat, April 13, 2 PM. Know Before You Go: Music and fun for everyone. Tickets: $12- $20. POC 270-769-8837. Presented in Partnership with Swope Family of Dealerships, Jimmie Dee Kelley, Dan & Diane Hafer, & www.ElizabethtownFamily.com. West Hardin Middle School Spring Choir Concert. 7 PM POC Anna Benningfield. 270-862-3924. (Date changed from April 23). Community Town Hall with Fort Knox Commanding General. 6 PM. POC Jessica Ward 270-872-8157. Bluegrass Middle School Band Concert. 7 PM. POC Joshua Mitchell. “Thirdsday” at Mark’s Feed Store. Mark your calendars, bring the voucher (or just show on your mobile device) and plan on having lunch or dinner or both at Mark’s to help support the PAC! Glen Rice/Buffalo Productions presents Glen Rice, Family & Friends. Curtain, 7 PM. Tickets $20 & $25. POC Glen Rice 270-325-3256. Tickets can also be reserved at the PAC, 270-769-8837. West Hardin Middle School Spring Band Concert. 7 PM. POC Laura Floyd 270-862-3924. Youth Theatre of Hardin County Auditions for their summer production of HELLO DOLLY. Friday at 5 PM. and Saturday at 11AM. POC Betty Marsee 270-765-5421. Central Hardin High School PRISM Concert. 7 PM. Damon King 270-737-6800. St James School presents 1st & 2nd Grade Spring Musical. 6:30 PM. POC Jordan Smith 270-765-7011. Western Kentucky University Graduation Ceremony. 6 PM. POC Ronda Sullivan ronda.sullivan@wku.edu. North Hardin High School Choral Concert. 3 PM. POC Beth Root 270-369-3167. North Middle School Band Concert. 7 PM. POC Brittany Ford 270-352-3340. Central Hardin High School Choral Concert. 7 PM. POC Brandon Centers 270-737-6800. John Hardin High School Choir Concert. 7 PM. POC Phyllis Westfall 270-769-8906. 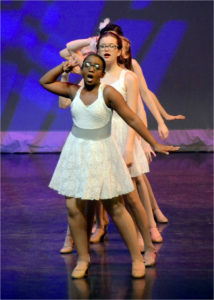 Dance Center of Elizabethtown Musical Theatre Performance, WILLY WONKA. POC Sherry Barnard, 270-765-5464. Fort Knox Federal Credit Union Annual Membership Meeting. Doors open at 5:00 PM. POC 502-942-0254. Hardin County Schools Board of Education Meeting. 6 PM. Student recognitions. POC Diana Jacobi 270-769-8817. The Dance Centre of Elizabethtown’s Spring Recitals. 2 PM & 4 PM. POC Sherry Barnard 270-765-5464. Allegro Dance Theatre Spring Recitals Friday, 7 PM and Saturday 1 & 7 PM. POC Carol Zagar 270-352-1333. Center Stage Dance Studio’s Spring Recitals. Recitals, Wednesday & Friday, 7 PM, Sunday at 3 PM. POC Yvonne Groves 270-769-5505. All seats are reserved and tickets will be available at www.TuTuTix.com. On March 1, 2, 24 students from John Hardin High School under the direction of Phyllis Westfall and Becky Lanham, presented the musical BYE BYE BIRDIE before audiences of nearly 200. On March 8,9, 21 cast members from Central Hardin High School Drama Club & Hardin County Playhouse under the direction of Sarah Dakin presented THE CRUCIBLE before a student audience of 444 and public audiences of 150. 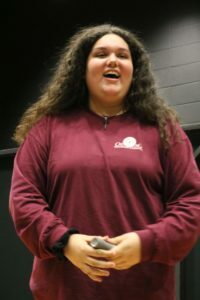 On March 9, 40 area youth participated in the third of three Youth Theatre of Hardin County Winter Workshops in prep for summer production of HELLO DOLLY. On March 10, 62 members of Heartland Winds Concert under the direction of David Coffing presented a free concert before an audience of nearly 200. On March 11, 143 band students from Central Hardin High School under the direction of David Centers presented a pre-assessment concert before an audience of 375. On March 12, 68 band students from West Hardin Middle School under the direction of Laura Floyd presented a pre-assessment concert before an audience of 175. On March 13, 63 wind symphony band students from North Hardin High School under the direction of Brian Froedge presented concert before an audience of 177. On March 27, 120 students from East Hardin Middle School 7th & 8th Grades under the direction of Matt Baucum presented a pre-assessment concert before an audience of 340. On March 15, THE PAC presented Kentucky Shakespeare in MACBETH before a student audience of 460 and public audiences of 262. On March 19-22, 40 students with Allegro Dance Theatre under the direction of Carol Zagar presented the musical MARY POPPINS before student audiences totaling more than 3500 and a public audience of 375. On March 25,26,27, the PAC hosted the KMEA Concert Band Assessment Festival. More than 2000 students in 50 different bands from 11 neighboring counties performed and were adjudicated while friends and family totaling more than 1000 looked on. On March 29, Boss Lady Coaching presented “She Started It” Film and Panel Discussion for girls featuring 8 area business woman before an audience of 555 middle school girls from 6 area Middle Schools. Some believe that the play Macbeth is cursed – insert scary music – and that it’s bad luck to say the title of the play or quote a line of dialogue from it inside a theatre (unless you are rehearsing or performing it of course). Doing so, they say brings tragedy upon the person who utters those fateful words as well as everyone around them. So, instead of calling the play by its title, Macbeth is instead often referred to by theatre folk as “The Scottish Play” after the country in which the story takes place. But how did this legend come to be and what can you do to guard yourself against the curse when you come to see Kentucky Shakespeare perform Macbeth at the PAC this month? One theory is that the spells chanted by the three witches early in the play are REAL, thus cursing any production. However, since Shakespeare gave no credit to these alleged co-authors, this theory is pretty difficult to prove. Another theory points to the fact that historically Macbeth has been plagued with accidents. However, considering how many fights, deaths and special effects are essential to the plot and how often Macbeth has been performed since 1606 its no wonder there’ve been more accidents attributed to it than any other play. Swear or recite a line from some other (un-cursed) Shakespeare play. Some superstitious purists even insist that the wrongdoer can only re-enter the building if they are invited to do so. This extra step would certainly make it easier to punish repeat offenders by leaving them outside. You now should be well prepared to safely come see Kentucky Shakespeare perform “The Scottish Play” at the PAC on March 15. And should you decide to tempt fate, pray for no rain. March PAC Kid Spotlight, Mallory Garcia, rehearsing for The Crucible. This month the PAC Kid Spotlight shines on CHHS student Mallory Garcia. Catch her in the CHHS/HCP co-production of The Crucible this month at the PAC! Learn more about Mallory and our other PAC Kids. John Hardin High School Winter Musical BYE BYE BIRDIE. Friday & Saturday, 7 PM. POC Phyllis Westfall 270-769-8906. Central Hardin High School Drama Club and Hardin County Playhouse present THE CRUCIBLE. Daytime student performance Friday at 10 AM. Public performance Friday at 7 PM and & Saturday 4 PM. POC Sarah Dakin 270-734-0021. Youth Theatre of Hardin County Winter Workshop (Last of three) in prep for summer production of HELLO DOLLY 11 AM- 3 PM. Parent meeting at 2 PM. POC Betty Marsee 270-765-5421. Heartland Winds Concert. Curtain at 3 PM. Free to the public. POC David Coffing. Central Hardin High School Pre-assessment Band Concert. Curtain, 7 PM. POC David Centers 270-737-6800. West Hardin Middle School Pre-assessment Band Concert. 7 PM POC Laura Floyd 270-862-3924. East Hardin Middle School 7th & 8th Grade Band Concert. Curtain, 7:PM. POC Matt Baucum 270-369-7370. At Barnes & Noble Booksellers: PAC Book Fair and a Celebration of All Things Shakespeare. THURSDAY MARCH 14 at the store featuring monologues and scenes. 6-7 PM. PLUS, please support the PAC by using the Book Fair Vouchers-PAC when making purchases at Barnes & Noble on March 14th & 15th. THE PAC PRESENTS: Kentucky Shakespeare in MACBETH. (90 mins). ONE NIGHT ONLY! “Something wicked this way comes!” One of Shakespeare’s most celebrated and perhaps even cursed pieces; Macbeth is a dark psychological thriller and masterful study of character and the lure of the occult. Kentucky Shakespeare returns to the PAC with this haunting drama of personal frailty and political intrigue. Know Before You Go: Rated PG. Best for grades 6 and above. 7 PM. Tickets: $12-$20. Produced in partnership with Barnes & Noble Booksellers & Kenneth & Nanette Johnston. THE PAC PRESENTS: Kentucky Shakespeare in MACBETH. School Day performance for classes/teachers 9:30 AM. $3 per HCS student, $5 all others. (Online Reservation Required). Allegro Dance Theatre proudly presents MARY POPPINS. Student performances Tuesday, Wednesday, Thursday, Friday 9:30 & 11:30 AM. Reservations Required. Public evening perf, Friday 7 PM. FOR RESERVATIONS contact Carol Zagar, 270-352-1333. KMEA Concert Band Assessment Festival. Mon, 5 – 9 PM, Tues, Wed, 8 AM – 9 PM. Bands will perform and be adjudicated. Performances are a brief 20 minutes for middle schools and 30 minutes for high schools. The public is welcome to attend. Performance schedule is closely followed. Structured audience “entering” and “exiting” can be expected. Plan to arrive early. All times are EDT. POC is Brian Ellis at 769-8906. Central Hardin High School PRISM Concert. 7 PM. Tyler Cantrell 270-737-6800. On February 2, the PAC hosted the 2019 Guest Speaker GOP Event featuring Mike Huckabee before an audience of 337. On February 3, 150 North Hardin High School Choir students under the direction of Beth Root presented a concert before an audience of nearly 475. On February 5, 19 students participated in the Hardin County Schools Spelling Bee before an audience of 72. On February 8 &10, 20 North Hardin High School drama students under the direction of Donna Thomas presented LAW & ORDER FAIRY TALE UNIT before audiences totaling 100. 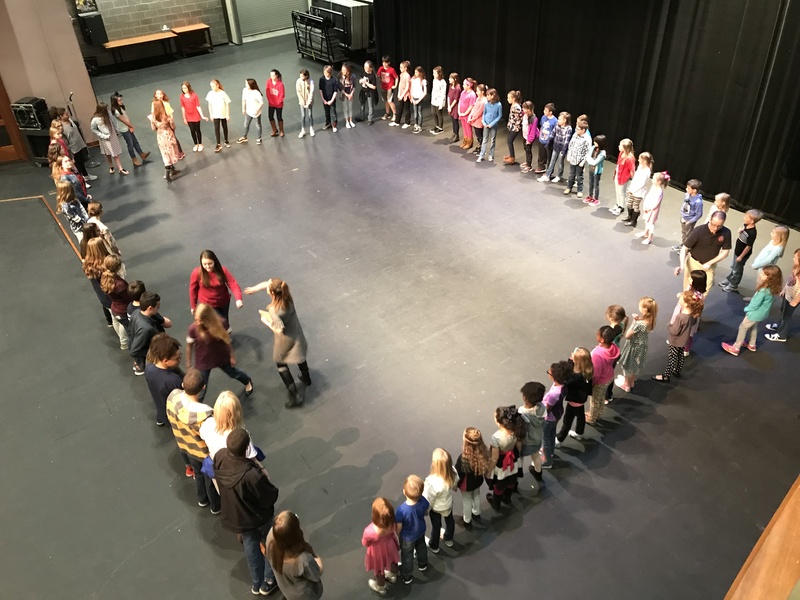 On February 9, 45 area youth attended the second of three Youth Theatre of Hardin County Winter Workshops in prep for summer production of HELLO DOLLY. On February 18, 68 North Hardin High School band students under the direction of Brian Froedge with a guest conductor W. Dale Warren, presented a concert before an audience of just over 100. On February 21, 144 HCS students were recognized for their accomplishments during the Hardin County Board of Education meeting before an audience of 225. On February 21, 22 & 23, 34 North Hardin High School choir students under the direction of Beth Root presented 4 school day performances and a public performances of the musical LION KING before student audiences totaling 2350 and a public audience of more than 300. It’s February. Share your love! Having closed the door at 221b Baker Street for the time being, my attention is now drawn to the more mundane. I know they aren’t due until April but with no PAC Season Events occurring this month, I’ve set aside February to get my taxes done. Like many of you, I try to view tax time as an opportunity to re-evaluate how I spend money and what I have to show for it in return. For example, I always spend too much on dining out and not enough on charities. The idea of one big check to my favorite charity no matter how worthy is more than I can comprehend. I have found it much more palatable to make small recurring monthly donations to the charities of my choice. 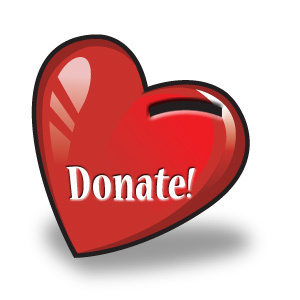 Many organizations, like us, even offer recurring monthly donations straight from their websites (just click our Donate button on the home page www.thePAC.net for easy instructions). So, while you attack your taxes this year, consider setting up a recurring monthly donation to the charitable organization of your choice (maybe even to the PAC). Just think, for the same cost as a monthly (or in my case weekly) visit to Taco Bell you could help out a worthy cause in Hardin County. This month the PAC Kid Spotlight shines on NHHS student Marliese “Lisa” Muchmore. Lisa will be setting up a cot at the PAC where she can be seen performing in her school’s drama club program, choral concert AND production of The Lion King, Jr. all this same month! Learn more about Lisa and our other PAC Kids. Congratulations to Vickie Baker, Lisa Caffee, Nancy Collett, Colleen Durall, Julie Grochala, Patty Higdon, Bonnie Linscott, Nicole Ozment & Lisa Simes — lucky winners each of a $20 PAC gift certificate for completing their A Study in Scarlet program surveys. 2019 Guest Speaker GOP Event featuring Mike Huckabee. Please click here for tickets. You can select your reserved seat in the Balcony for $40, Rear Orchestra Level for $55 or Front Orchestra Level at $75 plus fee. For a VIP ticket package, please contact Kathy Sargeant at 330-329-0925. Hardin County Schools Spelling Bee. 3:30-5:30 PM. POC Monica Oliver. North Hardin High School Drama Club presents LAW & ORDER FAIRY TALE UNIT. Friday, 7 PM. Sunday Matinee at 3 PM. POC Donna Thomas 270-351-3167. Youth Theatre of Hardin County Winter Workshop (Second of three) in prep for summer production of HELLO DOLLY. 11 AM- 2 PM. POC Betty Marsee 270-765-5421. Hardin County Board of Education Meeting. 6 PM. Student recognitions. North Hardin High School Musical LION KING. 7 PM. Tickets: $5. POC Beth Root 270-300-5614.